Children, at the early developmental-stage, can be extremely creative and some may even show an interest in playing music. 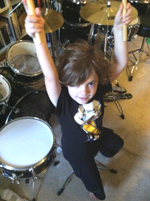 Sometimes the child will gravitate toward a particular instrument and he or she may even show an aptitude for it. It is at this stage that a teaching opportunity exists. If handled correctly, it may even result in the formal pursuit of the mastery of that musical instrument. 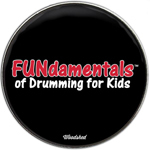 FUNdamentalsTMof Drumming for Kids is a fun way of introducing the basics of drumming to children who are between the ages of 5-10. Although there have been many programs developed for teaching music theory to children, few cater to younger age groups. This has resulted in a lack of educational techniques and lesson plans for kids. That is, until now. 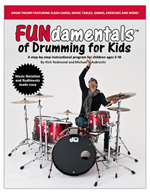 What sets the FUNdamentalsTM of Drumming for Kids program apart is the breakdown and presentation of the material. This program uses a variety of teaching techniques that mimic curriculum used in the elementary classroom. 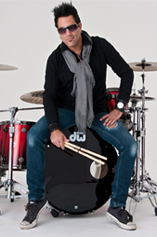 These exercises present drum theory in a fun and familiar way by using flash cards, counting exercises, clapping and more. 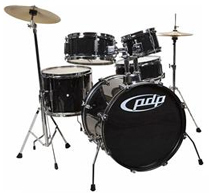 Each step in this program is designed to provide children with practical and applicable skills for drumming. Pictured: Co-author’s son Jackson (age 4) at his PDP’s “Player Kit”.